As the most stuff I present is demo (the slide deck is just 5 pages), people frequently ask whether I could write blogpost on one of the subjects. So why not create a sequence of 5 posts....that should make sense. 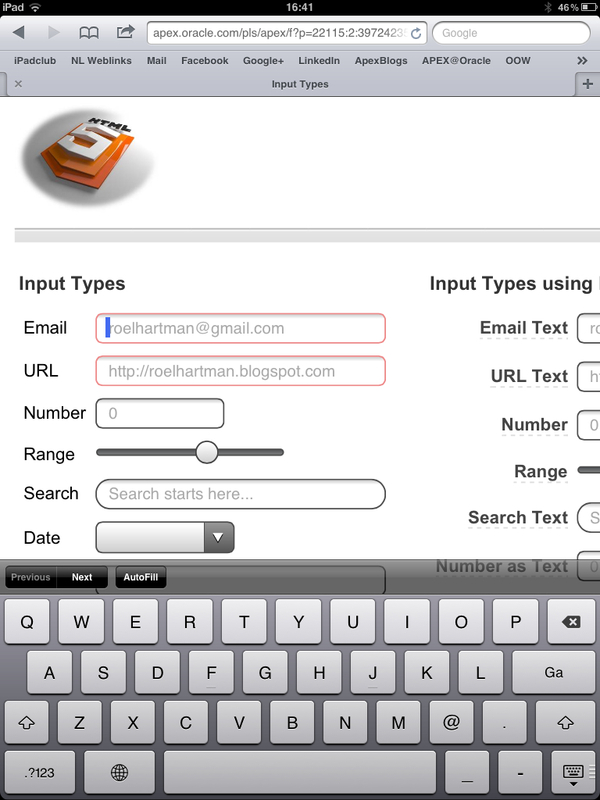 With HTML5, you can use both new Input Types as well as additional Attributes. 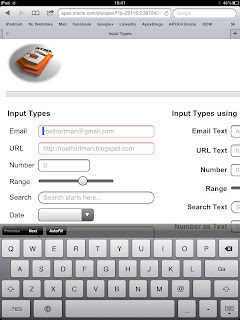 New Input Types are URL, email, number, search and more - see http://www.w3schools.com for a complete list. The definition is very straightforward. In your HTML, replace type="text" with type="email". So the definition is something like : <input type="email" value="" size="30">. In a regular, desktop, browser that change doesn't seem to do anything, but if you visit that page using a mobile browser, you definitely notice the difference: (On an iPad/Phone/Pod) the virtual keyboard changes and will contain a "@" sign. And something similar happens for URL's (a ".com" key will appear) and numeric fields. And that's all without any coding! But in an APEX environment you can't natively use these kind of fields - unless you write all the code the retrieve and store the information yourselves. Luckily there is a plugin available (on http://apex-plugin.com/) that bridges that gap. And even better...in APEX 4.2 these item types will be 100% native available! Apart from the new input types, you can also use the new attributes as defined on http://www.w3schools.com. Two of those new attributes are particulary cool : Placeholder and Required. The "placeholder" attribute specifies a short hint that describes the expected value of an input field (e.g. a sample value or a short description of the expected format). The hint is displayed in the input field when it is empty, and disappears when the field gets focus. you get the red boxes around the input field. (or using the setAttribute, getAttribute and removeAttribute methods). The last thing I would like to mention is the "speech" option, see a previous blogpost (http://roelhartman.blogspot.co.uk/2012/01/wouldnt-you-like-to-talk-to-your-apex.html) for more info on that one! The next post will cover Web Storage!